There wasn’t a bedroom for each person to have his or her own personal space. There wasn’t indoor plumbing. A fancy kitchen? They didn’t have that either. Instead of a tile, wood, or carpet floor, all that separated you from the dirt was the shoes on your feet. For Carmen and her family, they were lucky if they even had shoes to wear. When it rained over their home Carmen and her children often got wet. Instead of a sturdy roof and thick walls to protect them from wet weather, they had a leaking flimsy tarp to be their protector. A blanket was their home’s door, and cutouts of the tarp were their windows. When it was hot (as it often is in Ensenada, Mexico) outside their home felt like an oven burning up inside. Their home had no doors, locks, windows, toilets, bedrooms, sinks, a refrigerator, or floors. 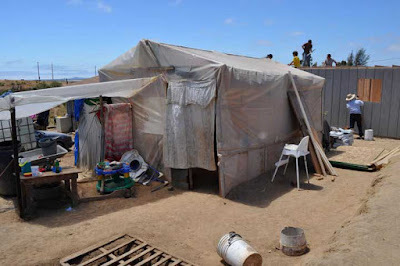 Carmen had five other family members currently living with her under this tarp that created two “rooms” for all five of them. Living with her is her 21-year-old daughter with her three young children (Carmen’s grandchildren…And sadly, I can’t remember all their names), and Carmen’s 15-year-old son Alejandro. Looking around their home you also see chickens, roosters, turkeys, and kittens walking around. Both Carmen and her daughter were once married but both of their husbands left them - leaving them to fend for themselves as they try to support their young families. Alejandro even took it upon himself to drop out of school to take care of his family. Instead of going to school to further his education and to live life as a teenager he has acted beyond his age. After dropping out of school Alejandro got a job on the fields so he can financially support his family. At the age of 15 he took it upon himself to become the “man of the family” and provide for his mom, sister, nieces, and nephew. 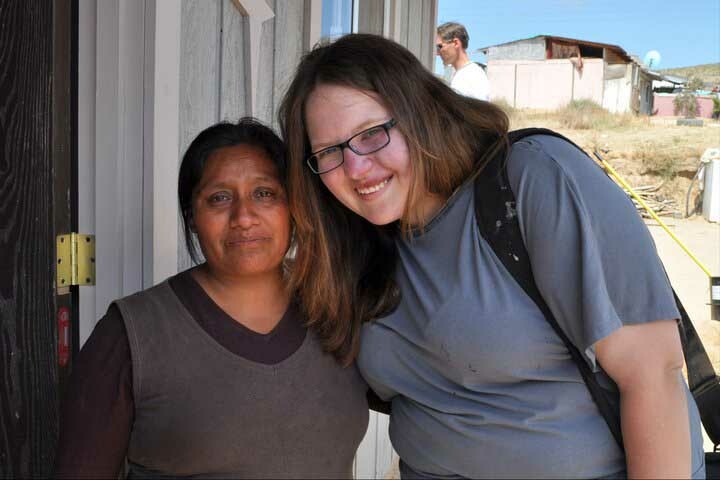 For 15 years Carmen dreamed of having a better home. Her life dream was to have a home of her own with a floor not made of dirt, with sturdy walls, and a strong roof. In June 2011 a team of workers from Fresno, California hit the road to head down to Ensenada to help Carmen’s dream become a reality. I feel honored to be able to participate as a member of the team. For one week our church’s youth group worked with another local church in our hometown. 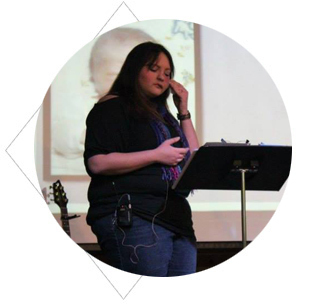 We were able to come from two separate churches to create one strong and hardworking team. Together we laughed, we cried, made memories, held devotions, worked together, and made lasting friendships. Together we nailed boards and painted Carmen’s home. We played with lots of children and got to know the Mexican church throughout different ministries. Regardless of language barriers and different cultures, we got to know the locals of Ensenada and learn their stories, dreams, and heartaches. I’ll never forget the week we spent in Ensenada and the people we got to meet. The moment that I know will forever be in my mind is the day we gave Carmen the key her new home. All week Carmen and her family chose to work along side us helping with the painting and nailing. Once the first day of building was over and the team started to leave, Carmen’s family sat on the cement foundation of their almost-built-home just looking around at the wooden posts that would soon be the walls. I can’t even imagine the level of excitement the family must have been feeling that night (or all week!) or the thoughts going through their heads. Tears trickled down her face as Carmen's 15-year-old dream finally came true. Just moments before the house dedication, I remember Carmen and her children anxiously look around the corner of their soon to be former home. The looks of excitement, aw, disbelief, and hope touched my heart. When dedicating the house the team passed around the key that would soon be handed over to the family. As each person held the key, they had a few minutes to share some words with the family. This was one of the most the most moving moments I have ever personally experienced. Carmen’s family is forever in my heart and prayers. Next summer our group is planning to participate with People’s church to return to Mexico. I cannot wait to see Carmen’s family again and to give her sweet grandchildren a big hug.